Groups fear impact of Obama administration’s PEPFAR stance. February issue. Leaders of Christian organizations that fight AIDS in Africa are expressing fears that the U.S. government is slowing its fight against the disease. The Obama administration is shifting its global health emphasis from putting more people on AIDS drugs to combating less-costly diseases. “There seems to be an AIDS funding fatigue developing on many levels,” said Nelis du Toit, director of the Christian AIDS Bureau for Southern Africa. 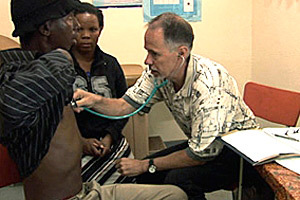 The 2010 federal budget allocates $5.7 billion for programs like the President’s Emergency Plan for AIDS Relief (PEPFAR) and the Global Fund to Fight AIDS, Tuberculosis, and Malaria. That represents a 3.6 percent, or $200 million, increase over 2009. “Technically, it is not flatlining, but given the very considerable growth over the past five years, the AIDS advocates are considering this flatlining,” said Ray Martin, executive director of Christian Connections for International Health.